Sichuan, Henan, Hunan, Shandong, and Hubei are the top five pork producing regions in China, accounting for 45% of total pork production in 2015 (cite). 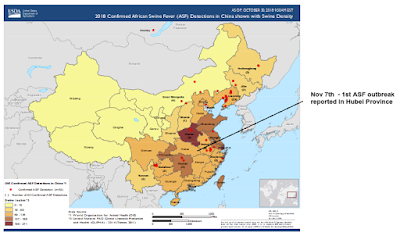 Over the past two months we've seen African Swine Fever turn up in Hunan and Henan province, and today it is Hubei's turn. The outbreak, reported by the MOA, is in Luotian County - which lies in the northeast of the province, very near the border with Anhui. Ministry of Agriculture and Rural Press Office 11 Yue 7 release, Luotian County, Hubei Province investigation and the African swine fever epidemic. 11 Yue 7 Ri 18 , the Ministry of agriculture and rural areas to the control center reported Chinese animal epidemic prevention, the China Animal Health and Epidemiology Center (National Center for Exotic Animal Disease Research) confirmed, Luotian County, Hubei Province, a farm investigation and the African swine fever epidemic. The farm pig herds 821 head incidence of 22 head and died 4 headers. After the outbreak, the Ministry of Agriculture and Rural immediately sent a steering group to the local. Started as required by local emergency response mechanism, to take the blockade, culling measures to deal with harmless treatment, disinfection, culling of all pigs died and sound processing. At the same time, prohibiting all pigs and their products to bring up the blockade zone, prohibiting the transport of live pigs blockade zone . Currently the epidemic has been effectively disposed of. While ASF doesn't pose a health risk to humans, it is a serious threat to the pig industry - and with no vaccine available - the only way to control it is to cull all of the pigs that may have been exposed. 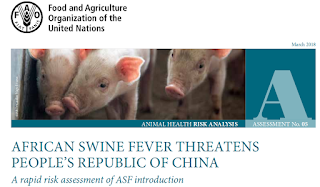 Meanwhile, ASF continues to make inroads in Europe as well, and further spread seems inevitable (see FAO: African swine fever (ASF) threatens to spread from China to other Asian countries).